What it's all about....We're helping to fix a park, restore a stream and build community!! Over several years, a group of community volunteers has formed to perform various improvement projects in and around Four Mile Run Park, design for the Four Mile Run Park Expansion, renovations of the newly acquired former electrical substation that is now Commonwealth Park (3550 Commonwealth Avenue) and sponsored a new park non-profit: the Four Mile Run Conservatory Foudation (www.fourmilerun.org). 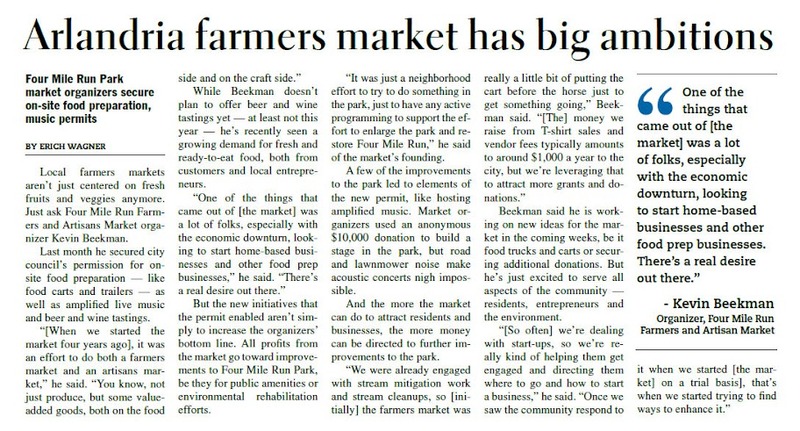 Four Mile Run Farmers & Artisan Market has committed yearly funds raised from market operations for various park improvements. Additionally, 4MRMarket was the first farmers market in Northern Virginia to allow the use of SNAP (formerly Food Stamps) to be used and to provide incentives with partnerships from Inova Health Foundation and Wholesome Wave. As a 100% neighborhood volunteer-run market, we are proud that the market serves as an incubator for small start-up businesses, a space for non-profits to promote their causes, and a community gathering place for live music, fellowship, and quality food and craft options. Alexandria Gazette-Packet (6/24/2010) - Fresh food and sunshine bring out Sunday morning shoppers.